£1.33 replacing £1.28, £1.52 replacing £1.47, £2.25 replacing £2.15. 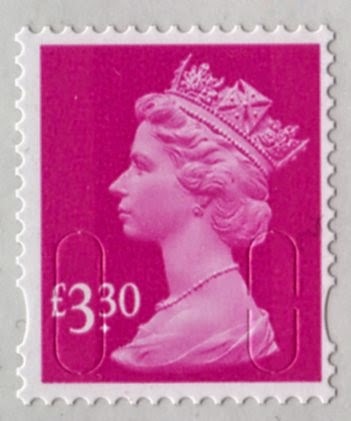 What I hadn't anticipated was that "Royal Mail and Post Office Ltd are working together to provide these stamps as an alternative to Post Office counter (horizon) labels.". 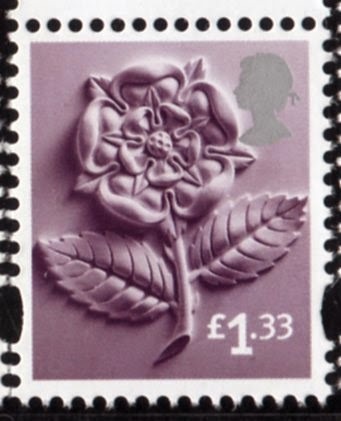 Even had I guessed that new stamps would be produced because of the new 'Pricing in Proportion' rules and rates being applied to international mail, I might have expected new NVIs, but in fact this will be one of the most expensive new Machin issues ever. 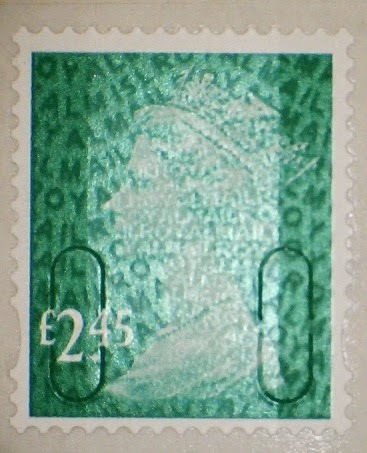 It's the most costly event since 17 February 2009 when the set of the first security-featured stamps weighed in at £15.75. This year's set - with no inland rate stamps - is £14! 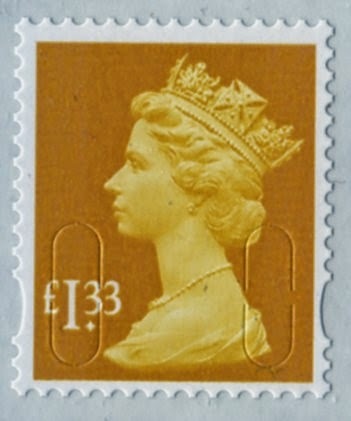 There will be no new Machin stamp for the surface mail rate which rises from 81p to 85p. The good news is that the £1 wood brown remains unchanged. Bad news on Country Definitives is that there will be two new ones for each country - £1 Europe letter up to 20g, ROW letter up to 10g, and £1.33 ROW letter up to 20g. My apologies for the quality of these pictures (see better ones below). 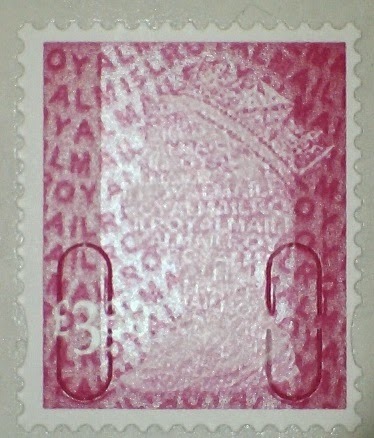 They are actually larger than those provided by Royal Mail, which accounts for the loss of quality. Also I can't be sure of the colours; while most of the Country Definitives are correct, some of the Machins seem to close to each other. I thought the palette had been designed to avoid such similarities. More technical details will be added to our website during the coming week, together with any first day and other special postmarks that will be available. 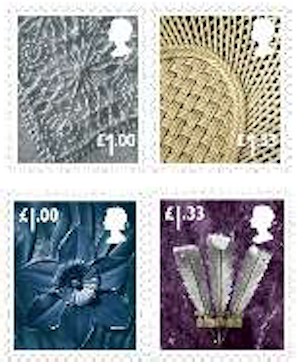 One thing I failed to point out last week is that the surface mail rate rises from 81p to 85p - but this new range demonstrates that there will be no new Machin stamp for the surface mail rate. UPDATE 24 March 2015 - better pictures. The £3.30 is close to the 7p of 2004, but the others are new shades of green, only slightly different from the 12p, 81p etc. Oh dear, this is a very worrying precident for our wallet. 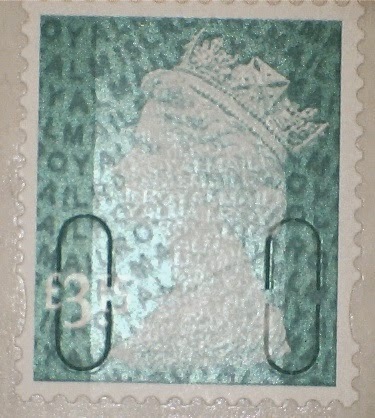 Presumably it is a quote from RM and PO stating that they will provide the use of stamps instead of labels? Unless the counter staff do not have the facility to print a label from their screen, you know and I know this is not going to happen, they are far to busy or can't do with the bother with stamps when all they have to do is touch the screen and a label appears. I have pointed out to you and others, that the RMSF and SD are not used and still in their safes. Can anyone say, with hand on their heart, that they know of any PO where stamps are issued for above without prompting or reminding? I think the Horizon system will be adapted to prevent the use of labels for these rates just as they cannot produce for inland 1st/2nd or 1stL/2ndL 100g. This may not happen immediately. As for SD and RMSF, there will be a greater tendency to use these when a batch of similar items is being mailed, so there will be occasions when stamps are used rather than labels; it saves a step. And of course the commission to POL from RM is greater for labels than for stamps, though I don't have any details. Your comments beg the question why the same restriction wasn't placed on the RMSF and SD stamps as well. Yes, I am cinical perhaps, but I suspect what will happen is that they will proudly announce that all staff will be prompted to use stamps on the screen at POS, which was promised for the other two, if this is the case and whether they have to override the screen or not, they will still opt for a label and who can blame them when they have a choice? 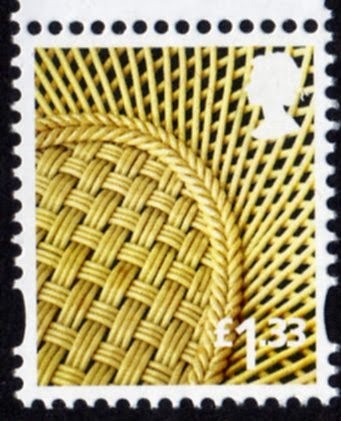 On a different theme, have you noticed M15L £1 brown being offered on eBay? You're right, that was the stated intention with the RMSF & SD and it didn't happen. Who knows why, it's very difficult to get answers on operational matters from POL. 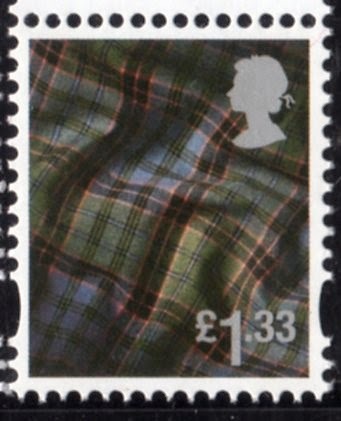 Nice to see a move away from labels to stamps, costly though it maybe, and they’ll fit on a DL size envelope with ease. I wonder if Royal Mail will try booklet versions now the weight step has been increased to a more realistic weight of 100g. It’s a pity about the lack of imagination with the colour pallet though. Let’s hope the new values don’t appear too often on the commemorative issues. Oh dear, as a person who works on a Post Office counter the introduction of more stamps is a serious retrograde step - they are a complete pain in the derrière and I will simply sell off or return the initial distribution ASAP - SD & RMSF stamps are useful on occasion & I am paid a slightly higher "commission" for using a SD stamp rather than a label but operationally postage stamps are just a nuisance. Thanks for entering what may well be a "Lion's den" and providing your perspective on this. I hope that the commission arrangements are modified suitably to accommodate this. How would you feel about a 'post and Go' style label at the counter (for any service or value) instead of a Horizon label? Obviously a new system would be needed but then POLtd need new systems to accommodate the bar-codes that they want printed on everything now. TBH Ian, "Post & Go" is a complete irrelevance for the vast majority of SPMR's - until or unless POL decide to upgrade or replace Horizon then labels are the foreseeable future. The restrictions on the first rate for inland / international labels was programmed into the Horizon system by POL as many SPMR's had figured out they were paid more for a label than selling a stamp. 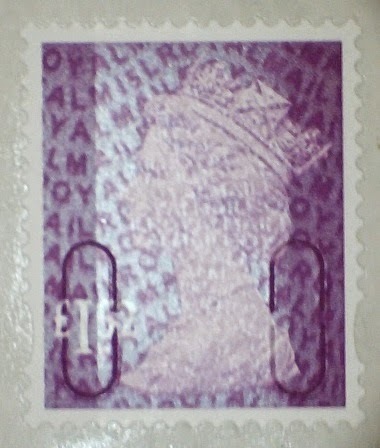 The option remains on RMSF or SD to use a stamp or label - esentially at the entry price level. I tend to use a stamp as the transaction it is (1) marginally quicker (2)has a slightly higher rate of commision on the stamp. It is very unlikely that POL will programme Horizon to force counter staff into using the new stamps for new air mail RoW rates. 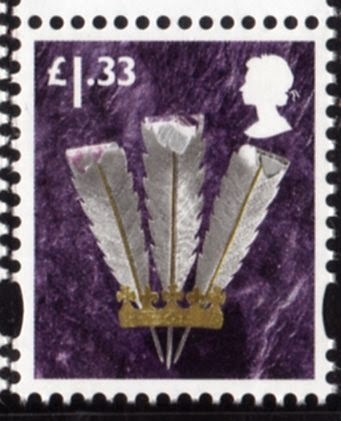 As things stand I have a choice of using either a stamp or label for, say, a 40g ROW letter priced at £2.15 - unless envelope size is a consideration I always use a label as I am paid more for this than a stamp. Thanks for the comments Richard. When I referenced Post and Go, I wasn't thinking of public access machines but a counter machine integrated to the scales by which you would produce, over time, a variety of different pictorial stamps or labels instead of the gold Horizon label. This would at least make the labels more acceptable to collectors and could see an increase in your turnover as collectors bought different sorts. 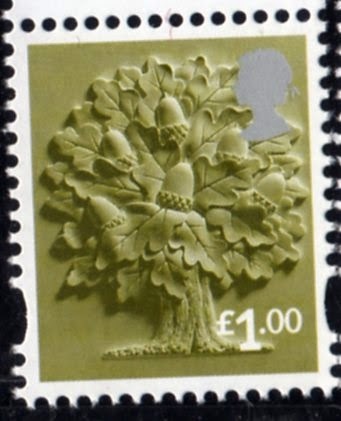 Oh, as an aside, I didn't really care about the 97p Christmas stamp "issue" apart from failing to grasp why our friends in RM issued the 81p special stamp., which are a bloody nuisance to get rid of. 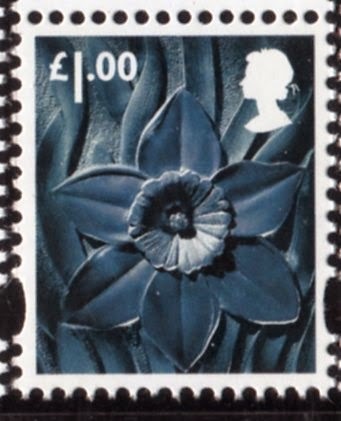 In reality, from an operators viewpoint, the only issue about 97p stamps at Christmas was we expected the 97p "special" stamp to be issued and accordingly hadn't stocked up on the definitive version which created some short term difficulties. I too commend Richard for stating what we already know to be true and that is that stamps are to be regardied as things to collect rather than to use operationally. We have to face up to reality and accept that technology is moving apace and our hobby needs to evolve. I regard your compromise to Richard as genius and worthy of merit, however, you must also realise, Ian that effectively, you are advocating a change that has been with us for 175 years and will be resisted from every quartet, particularly those from the higher echelons of our society? The blog from Richard is truly refreshing as it shows just how out of touch RM and POL is with its most valuablre asset, it's workforce. 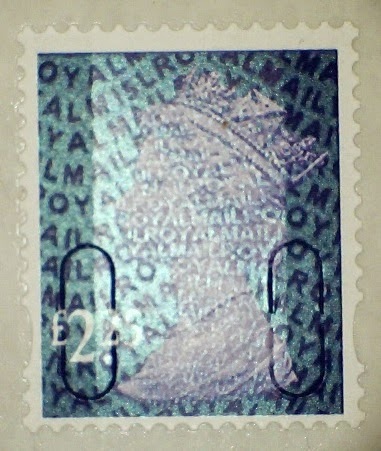 I would have thought that those were the two values most used, after the inland stamps. Be nice to have some here - slow from Edinburgh! Seems like a sales opportunity here. If Richard C puts a few in the post to Ian B, he could clear some of his overstock and Ian's understock and make a little profit too! Strangely I don't sell too many airmail stamps in the 10g - 20g price range & will be using up my current £1.28's on 100g SD items over the next couple of weeks. It may be a function of demographics - relatively affluent customers = larger & heavier cards? 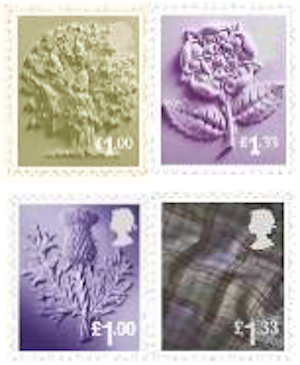 We already hold £1 stamps so being sent another load in 2 different designs feels a little bit like overkill. 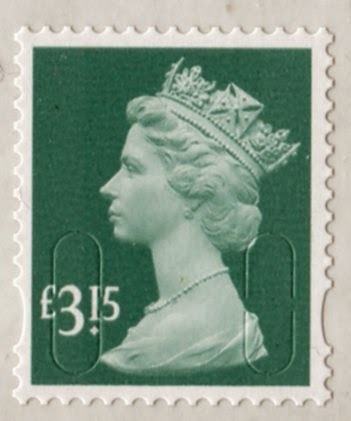 They haven't been to one of my local little post offices, came away last week with Stingray and the Crown Jewels (but then I am a stamp user), and have just started to send some letters to the US via surface mail, those recent 81p stamps are quite nice. Can't see many of the post offices stocking the new definitives after any initial stock is sold. The stamps I use most are 1p, 2p, 5p,10p, 20p sometimes covering the face of the envelope because there aren't any single make up stamps for next step prices from 2nd class to 1st class and regular to large letter. Could definitely do with a single 9p, 31p, 35p values to make up and they don't even have a value for the lowest small parcel rate. They seem to be more interested in producing stamps for rates outside the Uk, which everyone goes to the post office for anyway and they just give you a big label to stick on, if they don't do it themselves. 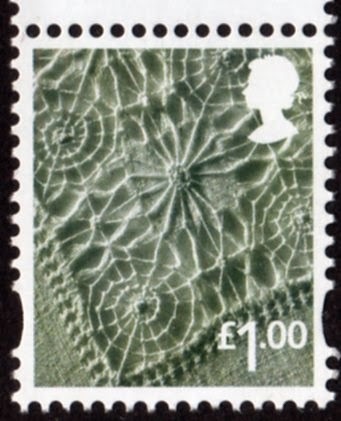 I was very lucky to raid another post office of 9p stamps, I think I took 100 off them a couple of years or so ago. It would be useful to have a stamp to take first/second class up to international airmail (or even surface mail) ratesI still have some 15p, 16p, 17p 22p stamps for adding on. Also have some old blue daffodils to use up too. Less surfing and more letter writing to use up these stamps! I think I'd better stick a notice up on my wall with stamp combinations for the international rates. Apologies for labouring the point but there is absolutely no point for a Sub Postmaster to sell definitive postage stamps as opposed to labels. 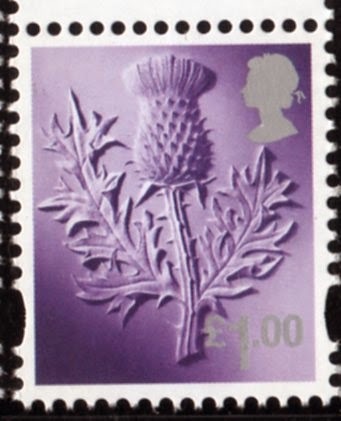 There are variations depending on contract type but in effect a SPMR is paid at 4% of the face value of the definitive stamp whereas a label generates both a flat rate payment and an mails acceptance payment for items >100g. So, if I process a £2.80 small parcel with a label the payment is about 29p. Thank you, Richard, for putting some meat on the bare bones that Royal Mail have already acknowledged. I agree - and I think most people would - that there is no incentive, and so the model is basically wrong. 1. If I bring a 500g 1st class LL prepaid at £1.50 and you add a label for 15p, what payment do you get? 2. And if the commissions were equal, or closer to it, would there be any other reason not to use (and therefore to stock) stamps? Thanks. All this is useful in our discussions with Royal Mail. Is there any difference if you use the special issue stamps as postage on parcels then for you Richard? The branch is on the old commercial contract so has fixed pay elements as well as product related variable pay. 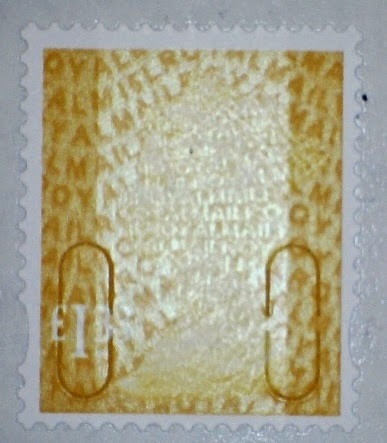 Special stamps are remunerated at exacty the small rates as their definitive counterparts. TBH the only way I would be interested in selling more stamps is if they were remunerated at a higher rate than postage labels. I find them a complete nuisance - ordering, reconciliation, accounting, returning obsolete stock etc.....labels win hands down at an operational level. All that Richard is saying is what we all already know and brings me back to my original comments. Technology, practicality and basic renumeration for POL services MAKES STAMPS IN THE FORM AS WE KNOW IT, OBSOLETE! When will any body with any influence such as your good selves, John Deering in GSM or, most importantly, Royal Mail themselves, become brave enough and come out and own up to the fact? This need not be the end of collecting; Your suggestion of labels at point of sale through the Horizon label system making stamps on roll seemlessly printed off in accordance to any demand from the counter staff as if it was a label, would become an acceptable and evolving solution to this problem rather than evermore expensive stamps as rolled out this year. Will they ever take an order from me again at Tallents house?